"I really like this recipe. 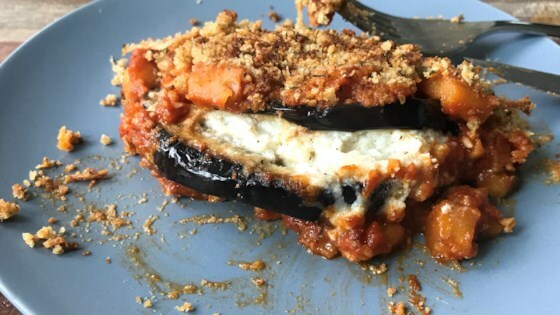 It's a lot easier and fewer calories than traditional fried eggplant Parmesan." Cut 5 crosswise slices from center area of each eggplant, about 1/2-inch thick, to total 10 slices. Peel and dice remaining pieces of eggplant. Heat 2 tablespoons olive oil in a large skillet over medium-high heat until oil is very hot. Sprinkle eggplant slices lightly with a pinch of salt and cook in hot skillet in batches until slightly softened, about 3 minutes per side. Set eggplant slices aside on paper towels. Heat 1 tablespoon olive oil in skillet and cook garlic for about 10 seconds; add diced eggplant and season with a pinch of salt and red pepper flakes. Saute until eggplant is softened, about 5 minutes. Pour in marinara sauce and water. Turn heat to medium-low and cook until eggplant is tender, about 15 minutes; stir occasionally. If sauce gets too thick, add a little more water. Combine ricotta cheese, 1/2 cup Parmesan cheese, pepperjack cheese, a pinch of salt, and a pinch black pepper in a bowl until thoroughly combined. Spread about 2 tablespoons cheese mixture over each eggplant slice. Fold eggplant slices in half to enclose the cheese mixture. Spread about half the sauce into an 8x8-inch baking dish. Lay folded eggplant slices in a single layer into the dish. Spread remaining sauce over eggplant slices. Combine bread crumbs, 1/2 cup Parmesan cheese, and 2 tablespoons olive oil in a bowl; mix thoroughly. Spread crumb mixture over eggplant casserole. Bake in the preheated oven until casserole is bubbling and crumbs are browned, 35 to 40 minutes. Another winner from Chef John! This was easy, healthy, and delicious. It's going into the 'keeper' file for sure. Even my vegetable-hating husband loved it!